Efflorescence or "bloom" is a type of white stain that can appear on the surface of concrete, lime and other masonry surfaces. It results when water passes through the concrete, bringing water-soluble salts and other materials in the substrate with it to the surface. 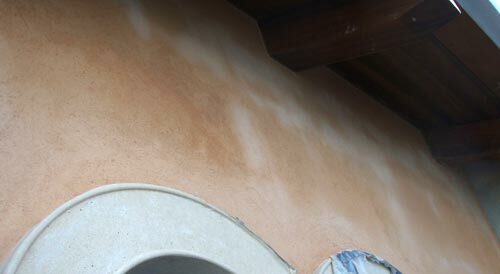 The addition of pigment does not have any bearing on whether or not efflorescence will occur, but it is certainly more obvious on a colored surface. Wet the surface thoroughly before and after scrubbing the solution. Muriatic acid is very dangerous to work with, therefore proper precautions must be taken and label directions must be followed. Stains that are not removed by this method may require proprietary compounds to remove.